GLOGIRLY: Gamer Week Day 4 - Monopoly! Welcome back to Gamer Week. We've been celebrating Glogirly's favorite childhood games all week. Today's game is a very special one. Just about everyone has some magical Monopoly memories. Glogirly LOVED games. And she REALLY loved Monopoly. But she was an only child, so often she had to persuade her mom and day to play with her. Her peeps were patient indeed. Have you ever played Monopoly with only 3 players? The game can last for HOURS. DAYS even. Glogirly honed her negotiation skills early in life by buying out her first losing opponent, thus dragging out the game for even MORE hours. Competitive AND persuasive. Her parents never stood a chance. She says she'd ONLY play if she could have the dog game piece. DOG??? Apparently there was no cat. Major flaw in the original game design. Major. 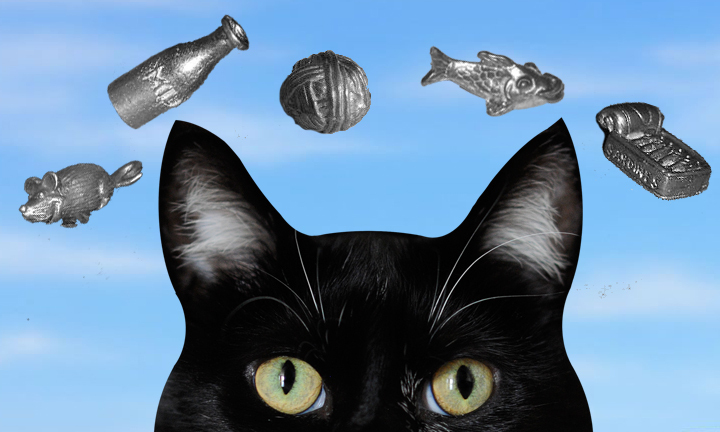 Even so, us cats picked up on the frenzy. I'm pretty sure the term "green papers" stemmed from the original Monopoly currency. Did I mention that Glogirly ALWAYS wanted to be the banker? What a control freak. Suspicious too. During my exhaustive research for this post...YES, I research my material... I discovered someone beat me to the punch. 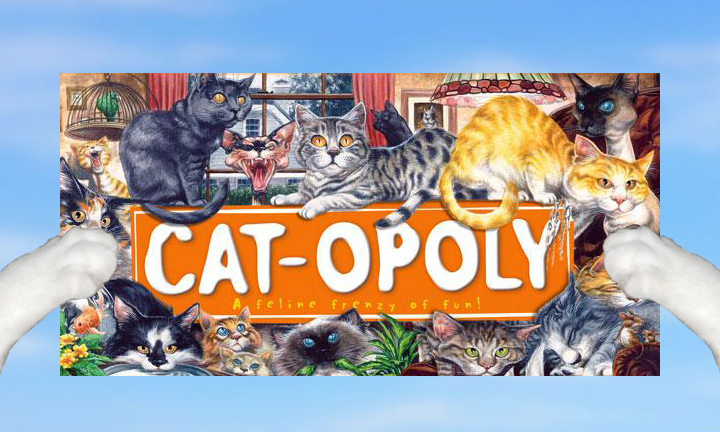 Did you know there's a real Cat-opoly game? The box cover could use a little help from GLOGIRLY DESIGN. Those cats scare me just a little. But check out THESE game pieces. WAY better than an old shoe and a stupid iron. I can't believe everything we has missed! We loved all these games growing up too, and we love your spin on them. The mom will be contacting you very soon. The Girl came home and they have just this week to get in all her appointments and prepare for college next year. Thanks so much for your condolences on the loss of my mother. It is really hard without her, but the manner of her passing and the support of so many friends has made it easier to bear. Thank you so much, and God bless you. 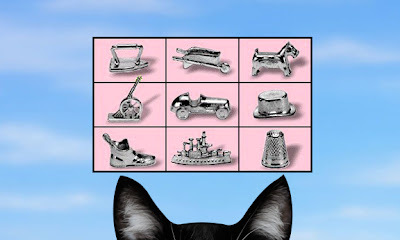 I want a Catopoly game! And, uh, yeah, they could definitely use some help from your human to redo that box cover! Seems like every good idea there is, sumbody beats you to it! That could use a make-over from your Mom, though. Happy Thursday, Katie. Ok, you GOTTA manufacture that game! Hmm, Mom says we should check out Catopoly. But also time to dust off the old Monopoly game. Thanks for reminding us of it. My Mommy is a monopoly freak, she used to play it all the time. The games would go on for days with rests in between of course. Thank you for this post, it was really cool. Fishie. I like the fishie! A lot better choice of game pieces in your game! Yarn? Milk? Decisions, decisions. What's your favorite? I LOVED Monopoly!! I always bought up the most expensive properties and charged rent with index-linked mark-up every time the competition went through Go! Catopoly is now a must have!!! We have the Catopoly game but the mom has never opened the box! Something about wanting to save it. What for, we say?? Let's play!! Horray! 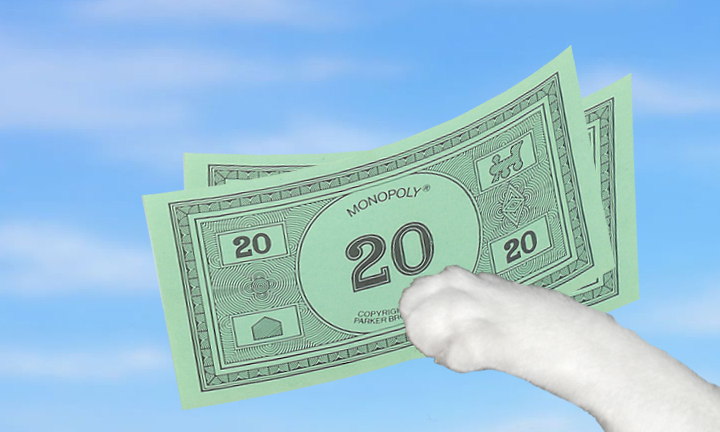 Glogirly always liked to use the dog piece in Monopoly! Our human agrees it's an interesting game. We never liked Monopoly. It often gets too long and no one really "wins." We agree that the cats on Catopoly are quite scary! Our Mom loved to play monopoly when she was a child. She still plays sometimes on the computer. And we had heard of that catopoly. That looks like fun. Glad you brought this up, brings back lots of good memories. I want to play CAT-OPOLY with Katie! No humans allowed. ok this is where we are totally different. I always hated Monopoly...too boring...yep I knew there was a cat version! i agree, they need your design skills! We've never heard of Cat-opoly! Do we get to buy nip and tuna and salmon? Mommy played Monopoly growing up, and ALWAYS took the dog game piece AND had to be the banker as well. Hahaha! Catopoly looks way better to us too. My Mom always wanted the dog piece too and says you should always buy Boardwalk and Park Avenue and put up hotels. I usually play a brisk game of Nipopoly! 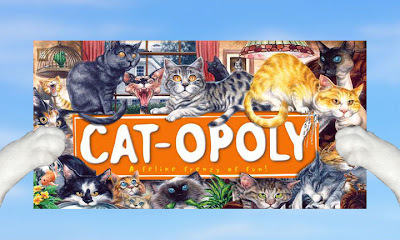 TW had the game Cat-opoly. The year she found it, all her friends got it for Christmas. She bought like a truckload of them. I don't think she has hers anymore. It either didn't survive the move or she gave that as a gift also. As far as Monopoly, her brother was a sore loser so even though they had the game, he'd never play with her so she either had to play along or not at all. Mommy and Daddy used to has a Monopoly Game. Then they gots one with the Simpsons and later one with NHL teams! Me thinks theys should get Catopoly! Maxwell: Faraday, dude! I see a Catopoly game in our future! Faraday: no WAYZ. Allie cheats. Catnip Acres, Catalina Island, Pawtucket Rhode Island, Kittery Maine...real estate could be much more fun with Catopoly. Nip flavored game pieces would make for a shorter game. 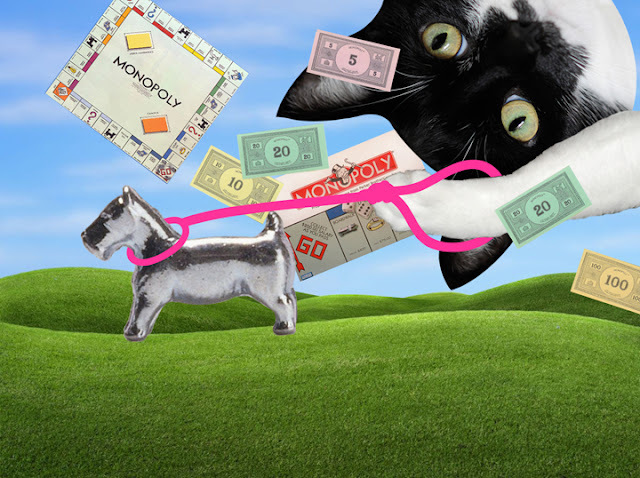 Our mum used to play Monopoly too and also had to have the dog. Well done!!! We had Monoopoly growing up, too. Dad (meowmeowmans) reports that his sister was RUTHLESS, and always wanted to be the banker, too. MOL.